Factory calibrated limits, which can be re-calibrated in the field with 2 trim pots. Interfaces with nearly any voltage output sensor. 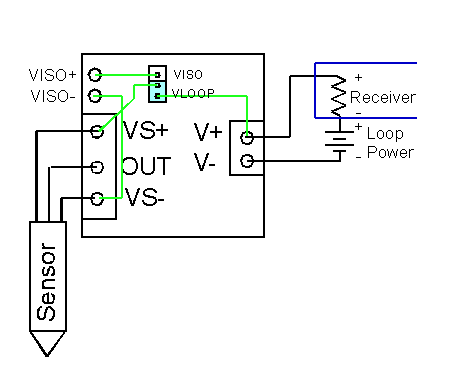 Can power sensors from loop current if the sensor consumes less than 4mA. Accepts isolated voltage supply for sensors that consume more than 4mA. Replacement of current sensors with low cost voltage output sensor. Interface voltage sensors to PLCs. Remote placement of sensors with long cables. Interface Vegetronix soil moisture sensors to programmable logic controllers. The current loop translator turns any analog voltage output sensor into a 4 to 20mA current loop sensor. Many types of programmable logic controllers (PLCs) only have current loop inputs, and are incompatible with voltage output sensors. We developed the current loop translator,because we received many requests to add current loop output capability to our soil sensors so that they could be directly used in PLCs. Current loops are useful because extremely long cables can be used with no signal degradation. Cable lengths exceeding 1 kilometer can be run with no degradation or scaling to the signal. Compare this to a voltage output sensor where the resistance of the cable forms a voltage divider and scales down the voltage as the cable length increases. The current loop translators are factory calibrated with two trim potentiometers, which adjust the 4mA and 20mA limits, respectively. If desired, these can be re-calibrated in the field with a simple calibration procedure which is described below. The current loop can read voltages up to 3.0V. Higher input voltages can be read, if the sensor voltage is divided by a resistor network. The translator can directly power sensors that consume under 4mA. For higher power sensors, an isolated external power supply is needed. The translator has 2 solderable holes that can be connected to external isolated power. The translator has a jumper which can switch between loop power, and external isolated power. Since the VH400 consumes more than 4mA it must be powered from an external isolated supply. The boards are marked with the terminal definitions. The jumper selects between loop powered sensors, and external isolated power. If the sensor is powered from the loop place the jumper on the VLOOP setting. If the sensor is powered externally, select the VISO setting on the jumper, and solder the power lines to +VISO, and -VISO. Figure 1. A current loop powered sensor. The green wires show internal PCB connections. With the jumper set to VLOOP the current loop supplies power to the sensor. Note that the current consumed by the sensor must be less than 4mA. The current is measured by measuring the voltage across the external current loop resistor, and dividing by its rated resistance. Figure 2. 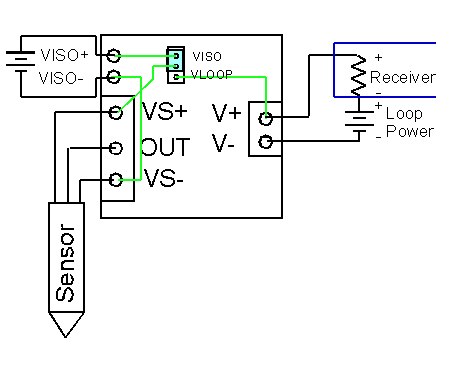 Sensor powered by external isolated voltage supply such as a battery. The green wires show internal PCB connections. With the jumper set to VISO the external battery supplies power to the sensor. Use this configuration if the sensor consumes more than 4mA. Note that VS- and V- must not be shorted directly or indirectly through a ground loop. For this reason the sensor must be powered with an isolated/floating voltage supply such as a battery so that there are no ground loops. The current is measured by measuring the voltage across the external current loop resistor, and dividing by its rated resistance. The current loops are factory calibrated with two trim potentiometers, which independently adjust the 4mA and 20mA limits, respectively. To perform the calibrations you will need to power the translator with a voltage supply in series with a calibration resistor. A 1% 100 ohm resistor is a good choice. Place the leads of a multimeter across the calibration resistor in parallel, and set the meter to measure voltage. Independently, adjust the 2 trimmer pots with a small screw driver to get the current adjusted correctly for both the 4mA and 20mA limits. For a 100 ohm resistor the multimeter will read 0.4V at 4.0mA and 2.0V at 20mA. To adjust the 4mA limit, short the sensor input terminals ( OUT, and Vs-) with a wire, and adjust the current across a calibration resistor in the current loop to 4mA. To adjust the 20mA limit, input 3V into the sensor input terminals (OUT, and Vs-), and adjust the current across a calibration resistor in the current loop to 20mA. Vboard is the voltage needed by the current translator board. Vr is the voltage across the current sensing resistor at 20mA. Vw is the voltage across the wire at 20mA. The best way to get started is to order a few sample current translators and try them out in your application. Contact us now to purchase samples.